I am so excited to share with you a much-awaited project between me and my sister Andrea. I was prompted by Andrea, a midwife with a private practice in Oakland, to put together recipe suggestions for her Xicana clients during la cuarentena. La cuarentena is a Spanish phrase in reference to the specific period of postpartum recovery of Mexican women - in which many new mamas are embracing so they can continue to carry on our family traditions. I loved the idea because I often get asked by members of my own community, here in Phoenix, for indigenous postpartum recipes. So, almost one year later, I am finally giving birth to this small piece of work as an offering to my Xicana sisters everywhere. The recipe suggestions are all based on my work in Traditional Mexican Knowledge and decolonized foods, combined with a sprinkling of my longtime training in the Indian healing art of Ayurveda. 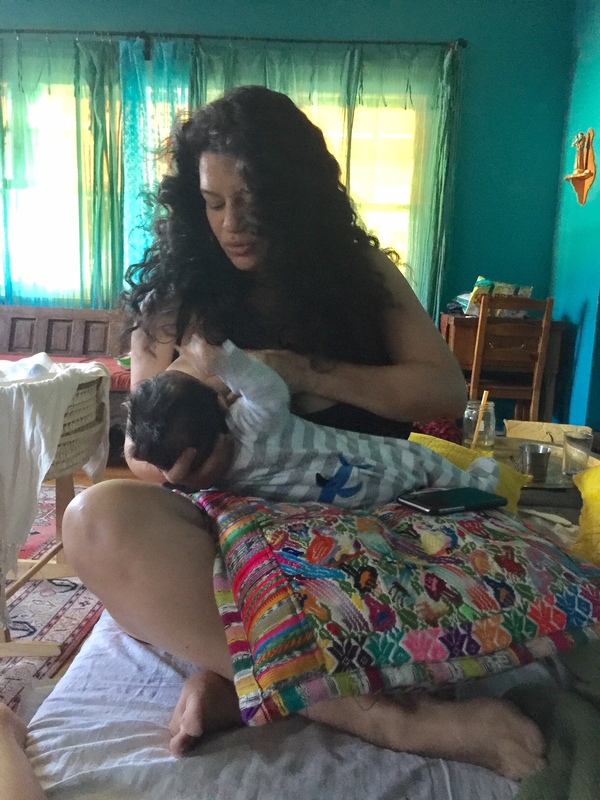 I believe Traditional Mexican Knowledge and Ayurveda work beautifully together as both indigenous systems recognize a period of roughly 40 days of healing after childbirth. The knowledge from both systems during this healing period include the binding of the belly with a rebozo or sari, the prescription of lots of rest, the need to consume warm and easily digestible foods, and the encouragement of new mothers to drink plenty of nourishing teas and broths. During la cuarentena, women traditionally avoid foods to be too hot or too cold, acidic, gas causing, overly spicy (as in heat), or too greasy. Many foods are avoided because of the belief they may cause colic in the newborn, while other foods and herbs are encouraged to help with milk production. For this reason, I am including several Ayurvedic herbs and spices which are excellent for digestion and the support of breastmilk production if nursing. Our Mexican grandmothers recognized the healing benefits of plants that arrived from faraway lands – herbs and spices such as anise, cinnamon, cilantro, comino, lavender, mint, and rosemary to name a few. So it is with great respect that I not only honor our abuelas indígenas with several of our ancestral foods, but also the indigenous grandmothers of India, who hold deep knowledge of their own plants, with many making their way across the sea and into our grandmother’s kitchens. I hope you enjoy the following as much as I enjoyed putting it together. As a homebirth midwife I can not emphasize enough how important the 40 days after the birth are. Birthing people will always remember how they were made to feel during this sweet and vulnerable time. It is a time for physical, emotional, and spiritual nourishment. Our ancestors understood this, and I see the benefits families receive today when we bring postpartum care back into practice. Birth is a ceremony. The birthing person goes through a huge process of opening up, opening up her body and heart to let the baby come through. The ceremony does not end right after the birth. She has just met with the most raw and primal parts of herself. Her consciousnesses is expanding as she takes on the role of mother of this new child on earth. It’s huge. The mother remains open during her postpartum days. The imprints she can receive from her community during this time of closure can be those of love and support. She can be fortified to become the best mother for this child. A new mama’s body is cleansing, healing, and rebuilding after birth. Everything she eats during this time should be soupy, warm, and moist to gradually restore her back to full power. The Mixtec people understood the Cycle of Life in terms of hot and cold categories - and these categories were also applied to food and medicines. The woman’s center, her womb, in its normal state is cool and moist - much like a clay olla. When she becomes pregnant, her womb becomes warm, and her olla begins the boiling so to say. It is believed that when the baby is born, the infant carries with it her bodily warmth. That is one reason warm moist foods must be given after birth, so that the woman may return to her normal state. The only common thread I have heard in listening to stories of "hot and cold" foods eaten during la cuarentena, are the idea that atoles, caldos, and warm foods are best. Some women talked of eating avocados, beans, and corn tortillas, while others stayed clear of those foods. Do your research...asking your abuelas and aunties for suggestions and do what feels right for you. New mothers need support during la cuarentena. Her body is seen as fragile and vulnerable following childbirth. She will be dependent on the social framework of those around her - from well seasoned mothers to friends, family, and partners to help with everyday meals. Below are some general suggestions to reference when preparing meals, keeping in mind that every family and every community is different. For the Mama: Test each of these dishes out to determine if you or baby have any sensitivities. Keep it simple and listen to your body. This will be the best path to take during the process of restoring balance to your entire Self. Many of these simply seasoned recipes contain Ayurvedic galactogogues in the form of spices for their medicinal benefits as well as for added flavor. Galactogogues are substances of herbal or synthetic origin believed to aid in initiating and maintaining adequate milk production. Common foods considered to be galactogogues are almonds, dark leafy greens, garlic, ginger, and papayas. Examples of spices are comino, fennel seeds, and turmeric powder. The Ayurvedic spices used in the following recipes are most beneficial when used in small amounts - such as in cooking and teas. Do not administer any of the herbs or spices in supplemental form (gel caps, tinctures) unless advised by a qualified herbalist or healthcare provider. Blue corn contains anthocyanins which enhance glucose metabolism and reduce glucose absorption. Atole is one of my family’s most traditional pre-contact foods and one of my favorite comfort foods. My mother carries Tewa blood from the pueblos of northern New Mexico, where she says they also called blue corn atole chakewe. Mix cold water and milk. Stir in cornmeal and continue stirring until it is blended. Bring to a boil over medium heat, stirring constantly (preferably using a whisk). The atole will thicken as it nears the boiling point. Remove from heat, let cool slightly before adding maple syrup. Quinoa originated with the Incas in the mountains of Bolivia, Chile and Peru. It is considered to be one of the most nutritionally complete foods. Turmeric helps with digestion and helps prevent mastitis. In the evening: Rinse quinoa thoroughly with cold water using a fine mesh strainer. Place the quinoa in a 1 quart mason jar and fill with cold water. Soak overnight. In the morning: Put the sprouting lid on the jar and drain the water. Find a cool place in your kitchen and set the jar upside down in a bowl to catch dripping water. Every few hours rinse the quinoa with water, pour the water out, and put the jar upside down again over the bowl. Once you see little sprouts emerging you know they’re done. Transfer quinoa to a saucepan and add 1 cup water, turmeric, vegetable stock or bone broth. Simmer covered for 12-14 minutes until quinoa is cooked. When you’re shopping for quinoa, look for companies that are Fair Trade certified or that say right on the packaging that they work closely with their farmers to make sure they are paid a living wage. Sprouting jars can be found in most natural grocery stores or on Amazon. Native Wild Rice is rich in iron, magnesium, potassium, and zinc while cardamom supports breastmilk production. This recipe makes a rather big batch to eat throughout the week or to share with your family. Feel free to cut it in half. Place wild rice, water, coconut milk, sea salt and cardamom in slow cooker. Turn heat on low and allow rice to cook for about three hours, or until most of the liquid has been absorbed and the rice is creamy. Add maple syrup to taste. Serve warm. Like many New Mexicans, our family called women’s breasts “chi-chis” as it related to nursing, which is a variant of the Nahuatl word for breast or teat. Breastmilk naturally contains lauric acid and capric acid which have powerful anti-microbial properties to boost the immune system. Coconut fat also contains lauric acid and capric acid, so it can boost the nutritional quality of breastmilk. Fennel is a galactagogue that promotes or increases the flow of a mother's milk. Dates are an ancient food of Western Asia and Northern Africa. They are a good source of various vitamins and minerals and are naturally super sweet. Mama Chi-Chi Balls make a nice little gift and the recipe can easily be doubled. Combine dates, coconut, coconut oil, fennel seeds, and pinch of sea salt in a food processor. Pulse, occasionally scraping down sides, until the mixture is sticky and holds together when pinched. Briefly pulse in almonds just until combined but chunky. Roll with damp hands into rounded tablespoon-sized balls. Heat a large skillet with a lid over medium-high heat. Lower heat to medium and working in batches, toast quinoa covered until you hear it quietly popping and it smells nutty, 1 to 2 minutes (this is easiest to do if you have a glass lid). Transfer to a shallow bowl and repeat with remaining quinoa. Roll balls in cooled quinoa. Balls can be kept chilled, covered, for 4 days. Eat at room temperature as a snack or dessert. This infusion is very delicate and nice to sip on throughout the day. Fennel seeds and fenugreek seeds are both milk producing spices. Boil fennel and fenugreek seeds in 2 quarts of water for 10 minutes. Pour seed water into a thermos to keep warm. You can add a tiny amount of maple syrup for added sweetness. Amaranth is a one of our most important pre-contact foods with high amounts of iron and protein. Cinnamon may be useful in alleviating excess gas, easing the digestion of heavy foods, and increasing the absorption of nutrients. Preheat the oven to 350º. In a large saucepan, bring all of the ingredients to a boil. Remove from the heat and pour into an oiled 3-quart casserole dish (coconut oil or ghee works well). Bake for one hour, or until amaranth has absorbed the liquid and is tender. Sprinkle with ground cinnamon, serve warm. If you prefer it a little thinner, simply add a some of your favorite milk. Nopales are rich in several immune boosting vitamins such as vitamins A and C. Well-cooked garlic supports the immune system, lactation, and digestion. Cumin and coriander seeds help balance and reset the body and mind. Bring broth, garlic, onion, and spices to a boil in a 6-qt. saucepan. Reduce heat to medium; cook until vegetables are tender, about 20 minutes. Add cactus and cook until very tender, 15–20 minutes. Season soup with sea salt and serve warm. with egg, tomato, onion and jalapeño slices. This recipe is also great using chicken if you do not have access to our sacred deer or elk. To make the chicken stock, first roast the bird, eat the meat, and then make the stock from the carcass. The apple cider vinegar helps to extract more nutrients form the bones and cartilage. To your large slow cooker, add everything to the pot and cover the bones with the water. Turn your slow cooker on low, cover and cook for 12-24 hours checking in occasionally to make sure there is enough water to keep the bones covered. After the broth has cooled for at least an hour, remove the bones with tongs or a large slotted spoon. Strain the broth through a fine mesh colander or strainer into a large bowl. Allow the broth to cool before pouring into wide mouth glass jars. You can remove the fat on the top if you like. To serve, use in soups, stews, or simply warm up and drink this magic elixir. One cup of cooked pumpkin has more potassium than a banana - which means it's good for muscle recovery. Ginger and cardamom are excellent for breastmilk production. According to Ayurveda, ingesting ghee helps you keep warm from within. Add all ingredients to a baking sheet. Using hands, mix the pumpkin with the ghee/oil and spices. Place wedges flesh side down. Add water to about ¼ the level of the pumpkin and bake for about 30 to 40 minutes. Serve warm or at room temperature. You can finish with a little sprinkle of cinnamon. This also tastes good on top of the recipe for amaranth con leche. Chayote has been cultivated in Mesoamerica since pre-Columbian times. This vine-climbing fruit is high in folate, which has been found to help with postpartum depression. Heat olive oil in a thick-bottomed pan, add chayote. Stir for one minute, add 1/2 cup of water, turmeric powder, and a pinch of sea salt. Stir. Simmer covered on medium heat for about 10 minutes until chayote is soft adding more water if needed. Serve warm. This aromatic beverage made golden by turmeric, which supports breastmilk production. Turmeric has been shown to reduce inflammation in nursing mother’s breasts so that they can continue to breastfeed for longer durations. If this is a recipe you enjoy, you can easily multiply the spices and store them in a little jar so you can easily prepare it daily. Warm the almond milk in a small saucepan. Heat the milk to a low boil, add the spices. Continue to heat on very low (do not boil) so the spices can marry. Lastly, add the maple syrup. Enjoy warm in the morning. Oats boost your milk supply and chia seeds are high in essential minerals like calcium, copper, iron, magnesium, manganese, and niacin. Chia seeds are an excellent ancestral food for healing and have a texture I love when they blossom from the liquid they are soaked in. Please note: this recipe is high in fiber, so be sure to drink plenty of fluids after eating. Add milk, oats, cardamom, chia seeds, and salt to the jar. Mix. Cover with lid and place in refrigerator. The next morning allow avena to come to room temperature and then sprinkle with cinnamon and add a few wild blueberries if you so desire. Sweeten with maple syrup and add more milk if you prefer a thinner consistency. The word quelite comes from the Nahuatl word quilitl which simply refers to any wild, edible green. Most of the quelites eaten are wild amaranth, purslane, and lambsquarters. 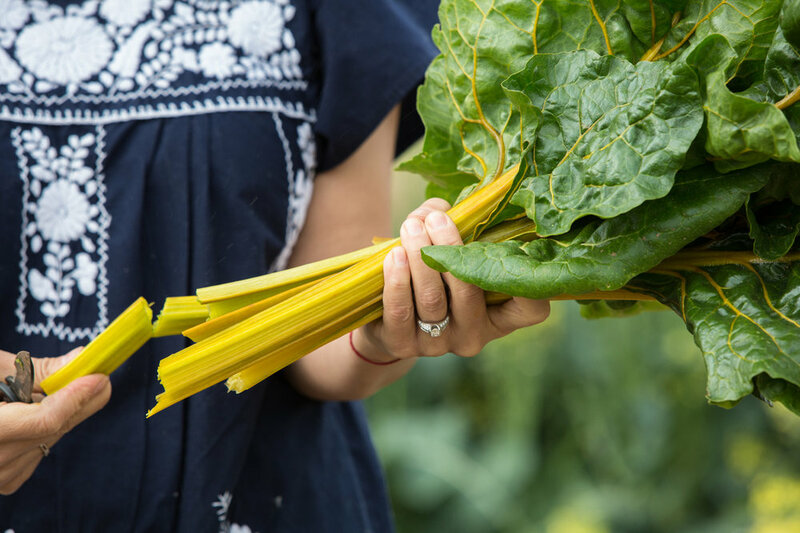 If you cannot get ahold of wild greens, you can substitute fresh spinach or Swiss chard. Dark leafy greens are rich in protein, minerals and vitamins, perfect for a nutrient dense dish. If you are not at the end of your la cuarentena, I suggest you omit the pinto beans and substitute with a fresh egg. Warm the oil over medium heat in a deep, wide skillet. Stir in the onion and sauté several minutes, until translucent. Add the greens and cumin. Cover, reduce the heat to medium low, and cook for about for 5 - 10 minutes, until the greens are wilted but still deep green. Stir in pinto beans and heat through. Add salt. Serve warm. THIS OFFERING OF SWEET MEDICINE IS DEDICATED TO MY NEPHEW FELICIANO COLIBRI, WHO WAS BORN ON MY BIRTHDAY, INSPIRING ME TO COMPLETE THIS PIECE OF WORK. A SPECIAL THANK YOU TO PARISA PARNIAN OF SAVAGE MUSE DESIGN STUDIO FOR YOUR LOVELY ILLUSTRATIONS CHANNELING MY IMAGINATION, AND THANK YOU TO MY FAVORITE PHOTOGRAPHER NICKY HEDAYATZADEH FOR CAPTURING MY WORK FOR OVER 15 YEARS.